Being the sole lover of sushi in my family is a bit lonely at times. Michael isn’t into it and when I’ve brought home little boxes of vegetarian California rolls and shared them with the boys, they are more likely to leave it than take it. So I pass by the sushi restaurants and just occasionally pick up a box of sushi at Wegman’s when my cravings come on, or I cheat and make some faux sushi like these little crackers at home, though once I take a bite it doesn’t feel like cheating at all. 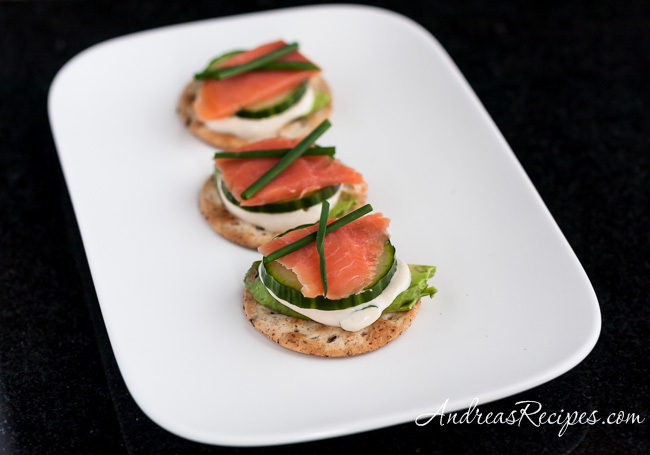 I whip up a cream cheese and sour cream dip with tamari soy sauce and grated ginger, then layer it on whole grain crackers with thin sliced avocado, English cucumbers, and smoked salmon, then top it off with fresh chives from the garden. This recipe is party sized, but I keep the dip in the refrigerator and indulge my cravings with just a cracker or two or even as a vegetable dip. It’s good either way. 1. In a medium mixing bowl, mix the sour cream and cream cheese until blended. Add the tamari, ginger, and green onion and stir until thoroughly combined. 2. Transfer to a storage container and refrigerate until the flavors have married and the dip is completely chilled, at least 2 hours. 3. On each cracker, place an avocado slice, 1 teaspoon of tamari dip, a slice of cucumber, and a square of salmon. Top with 2 chive pieces, laying crosswise. Oh, I’m so sorry you are the lone sushi lover at your house. Clever idea! I love this idea! I have a lot of sushi-averse people in my family and I just don’t get it! Just a little question: you call for 8 oz. of sour cream (softened) and 4 oz. of cream cheese. I’m confused! I’m not trying to be cranky here, just need to know what I’ll need to use to make this as GORGEOUS as your photo shows — with the right consistency. Thanks for a wonderful idea. Thanks for catching my typo, Lizzie. It’s supposed to be the cream cheese that’s softened. I corrected the recipe post and the print version. Thanks for the clarification, much appreciated. Will be making this for a very special luncheon in a few weeks. I also love sushi and this time it’s on the cracker that’s a great idea. What a great way to get my sushi fix at home; I literally could eat the stuff for every meal.